Plate aluminium trailer boats are enormously strong. They typically have 3mm decks, 4mm sides and 5mm bottoms – which is the same as a 30 metre ferry would have. The Coraline 800 goes beyond the ferry with a 6mm bottom. The owner can feel confident of owning a boat that will last. The paint can be the vulnerable thing, though, and Coraline was an early adopter of leaving the metal naked on the parts of boats likely to touch jetties. Coraline also made sure the rails were within the gunwale’s perimeter so they did not become de facto fenders. Few people buy bigger boats to fit more people on board. 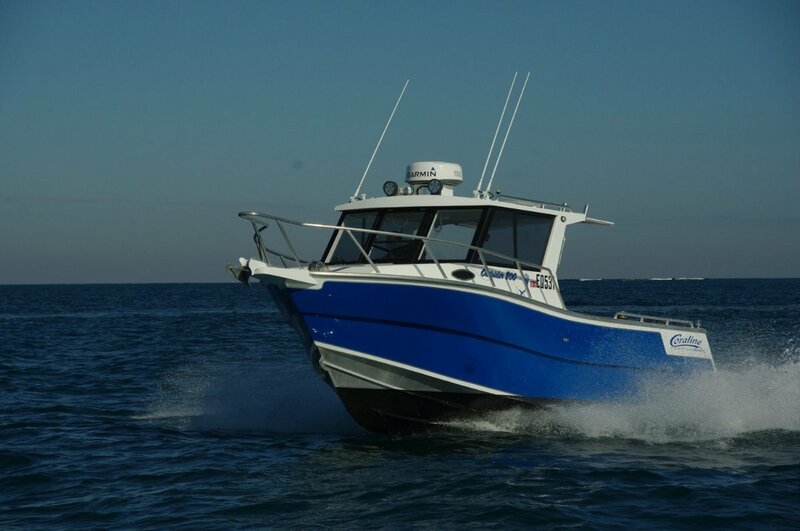 The actual reasons include the ability to go further offshore, greater range generally, a steadier fishing platform, reduced motion through greater length and, sometimes, the ability to stay on board for a few days. The 800 will satisfy all these. Although it is not intended as anything other than a fishing boat – the bunks in the fore cabin are seats rather than beds – it is certainly possible to live aboard for a while. The cockpit has plenty of room for swags or air beds and sleeping bags; there is a 51 litre fresh water tank; a deck shower; and the means of keeping and cooking food are almost lavish. A galley unit aft of the main seating position is equipped with fridge, stove, sink and worktop. This galley is pretty much in the open as a matter of need, but outdoor galleys make so much sense for our climate. Even houses are getting them now. Most Coraline hardtops are open, with a gap between top and windscreen that can be filled with clears. This one is closed – glass all the way – in the interest of maximum protection if caught by poor weather. The down side of less air flow is fixed by a combination of sliding side glass and an opening panel mid windscreen. The structure of the hardtop and its supports is the usual bomb proof Coraline product. The grab rails along its edges serve the second purpose of tie downs for gear. On extended trips a kayak or two might be wanted, or a deflated inflatable. The 800 has the stability to take this kind of high mounted gear in its stride. Unusually, the 800 has three seats at the windscreen. The skipper’s faces the usual direction, but the other two are side by side on a settee mounted fore and aft. This allows passage into the cabin and is also a very matey set up. Statistically, there will rarely be more than three on board, and arranged like this they can all converse with ease. For busier occasions a settee aft can double the number on board; at other times it folds to make more fishing space. Coraline thoroughly equipped this 800 for the fishing role. The electronic fit out is jaw dropping, with radar, sounder and plotter all from the top of their ranges. Power assisted fishing comes from a pot winch and associated tipper. More power hauling is provided by the anchor windlass: a very worthwhile accessory on a boat of this size. A solar panel helps cope with the winches’ electrical demands. For returning to base after dark a pair of LED spotlights has astonishingly long range. All the more usual fishing items are present. A fabric extension to the hardtop brings shade to more than half the cockpit, and that is definitely a fishing item. A battery of rocket launchers adds to the capacity of the coaming rod sockets; a jumbo sized catch tank could as easily be scuba storage. A demountable bait board and a deck was round things off. The chosen power unit is a 300hp Yamaha. This notably economical motor teams with a 450 litre fuel tank to give significant range. It could easily cope with extended trips to the Abrolhos or the Montebellos. With this motor the 800 exceeds 35 knots, something it will seldom do. Most of the time it will travel in the low 20s on less than half throttle sipping gently at the fuel. Getting to within striking distance of these distant spots means a lot of towing, but despite its size and uncompromising construction the 800 does not need anything very special to do the job. Dry weight of boat, motor and trailer is a hair under 2.2 tonnes.